What a difference a year makes! In August 2016, we were just beginning to emerge from the tangle of diagnostic exams and new medical terms, trying to figure out what we needed to deal with. By August 2017, A- was walking, talking, interacting, and cheerfully developing on track, which was a great relief. 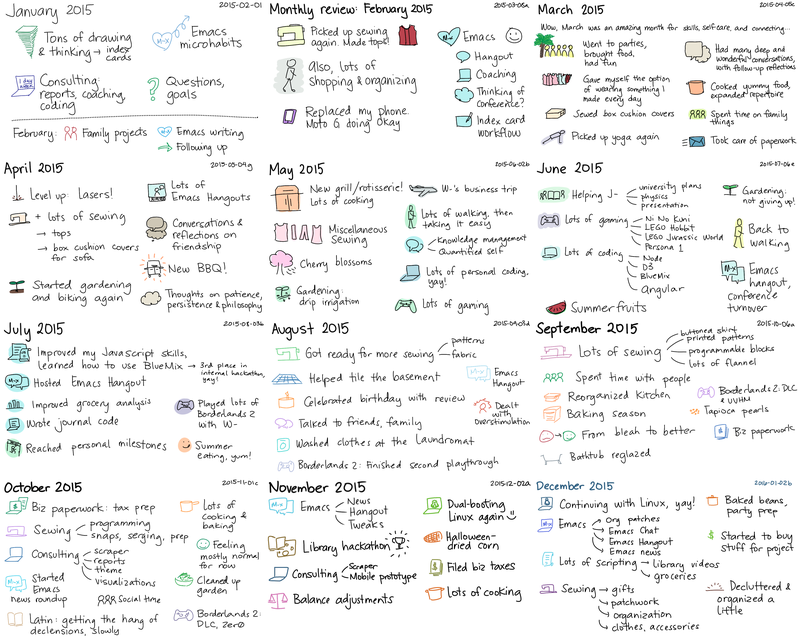 I’ve finally cleared some time to do my annual review, so here goes! We made the most of W-‘s parental leave with plenty of time together, a three-week trip to the Philippines to visit my family, and lots of home improvement (workshop, wardrobe, and part of a porch rebuild). After he went back to work, we established new routines which seem to be working quite well. I checked out lots of parenting resources and workshops, consulted various agencies for help with assessing and monitoring A-‘s development, and gave myself a crash course in early childhood education. We’ve been making good use of our membership at the Royal Ontario Museum, and I’ve been singing lots of songs we picked up from circle times and toddler classes. I’m pleasantly surprised at how fun it is to learn about all sorts of stuff. As we settled into regular routines, I reclaimed some discretionary time. It turns out that I can usually get an hour of discretionary time at night, if I stay up after A- has gone to bed. 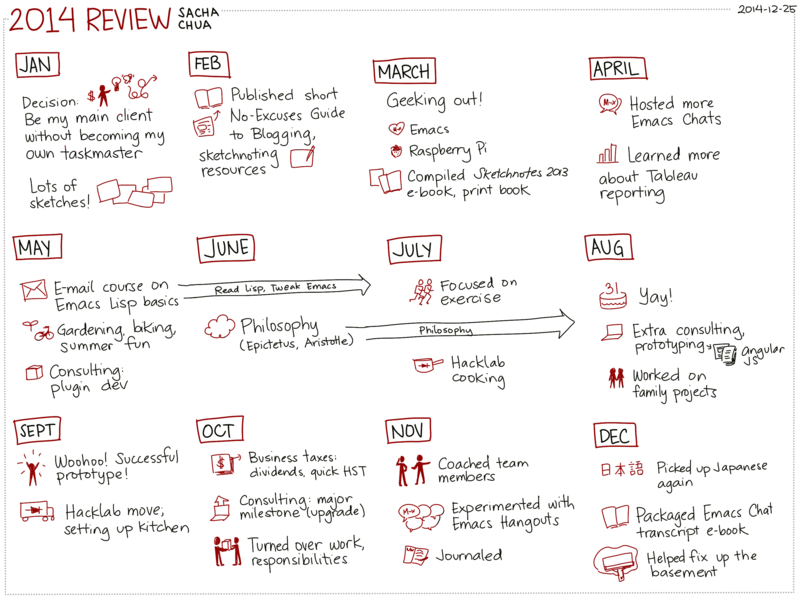 That’s been handy for updating my journal, doing some consulting (mostly SQL and a little prototyping), posting Emacs News summaries, and learning more. 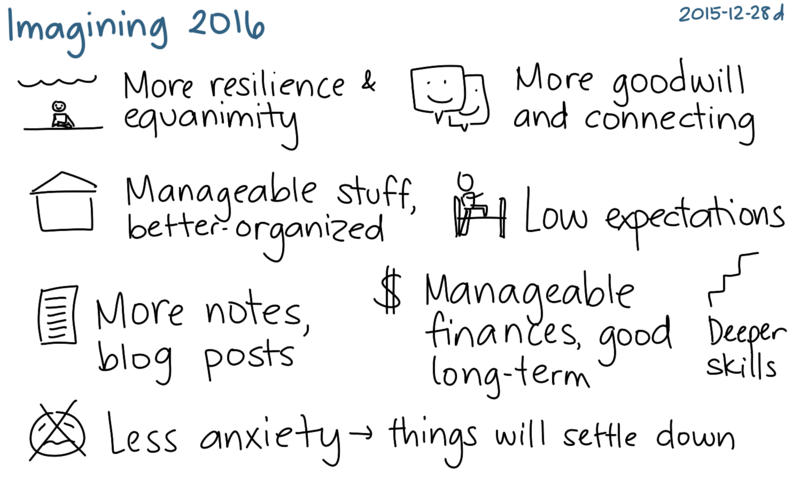 There were a few big uncertainties this year. What were the parameters we need to work with in terms of A-? Microphthalmia means regular trips to the ocularist and ophthalmologist, prostheses, and some adaptation in terms of vision and socialization. Her ventricular septal defect seems to have no impact on her growth, and just needs routine monitoring to check on the right ventricle muscle bundles. The liver hemangioma also needs routine monitoring. Enamel hypoplasia means being more careful about cleaning her teeth, with possible dental work later. She doesn’t seem to have any developmental delays. Also, she’s pretty darn awesome! Will I be able to adapt to stay-at-home parenting? This worked out surprisingly well, and I’m glad we structured our lives this way. I find it interesting, and I’m learning a lot. I’ve scaled down consulting because of time constraints and brain fuzziness, but that’s still okay. It’s been super-helpful to be able to adapt to A-‘s sleep schedule and interests. How do we want to parent? I resonate with ideas from attachment parenting, Montessori education, and a few other parenting philosophies. I’ve been pretty good at staying calm and managing the usual new-parent anxiety. I’m learning more about early childhood education and child development. What’s worth spending time and money on, and what can I postpone or avoid? Journaling has been very much worth it. Compiling Emacs News doesn’t take much time, and it’s been useful too. I can do enough consulting to keep my clients happy. Reading and improvement time pay off, too. 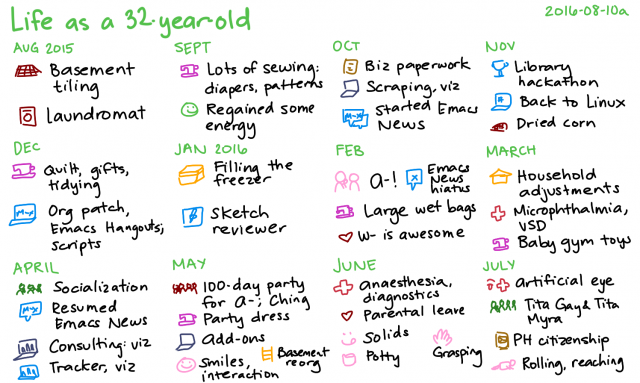 I’ve also been able to do personal coding (mostly Quantified Awesome) and a tiny bit of sewing, but those are harder.We’ve been pretty frugal in terms of baby-related stuff, and keeping things simple has worked well for us. I started using the opportunity fund for A- – not because I think this will result in a prodigy, but because it’s enjoyable and good to explore all sorts of things together. What are the health challenges facing my family, and how can we support them? It was a tough year for my parents and my sister, and they’re not out of the woods yet. I can’t help much with the day-to-day stuff over the distance, but I can check in with them over Facebook, listen, share stories, let them interact with A-, help with research, and respect their decisions. What will it be like to take A- to the Philippines? Both A- and I got overtired on the flights during our first trip, so it really helped that W- was there. It was great being able to share the load with him on the ground, too. Nice spending time with family and friends! How can I support W- as he takes on larger projects? Taking care of A- lets me free up time for W- to work on the porch, and reading about stuff helps me chat with him about the work he’s doing. Compared to last year, I’m more confident about parenting. I use general areas of child development to guide my observation and planning so that I can offer A- a variety of options, and then we follow her interests from there. As I expected, parenting is the sort of thing that gets more fascinating if I geek out about it. 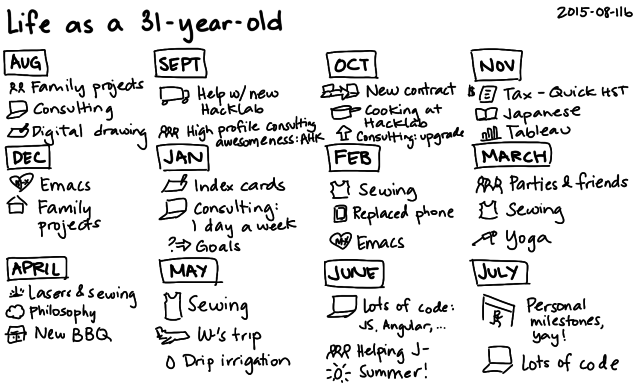 I haven’t been able to code much, since I’ve been prioritizing sleep and my journal. I feel less articulate – like my brain occasionally gets a little tangled – but maybe that’s just because I’m more aware of speaking, or maybe that’s sleep deprivation. It’ll probably sort itself out over time. I feel reassured by the way we’re dealing with things. It’s nice to be able to test Stoic philosophy and find that it works well for me. How did I spend my time, and how do I feel about that? Childcare went way up, of course, since I had a kiddo for 100% of my life as a 33-year-old and 50% of my life as a 32-year-old. That took time away from pretty much everything else, but I’m okay with that. I’ve worked out a sleep pattern that usually lets me feel pretty rested: try not to stay up more than two hours longer than A- does, and nap when I can. An hour or two of discretionary time isn’t quite enough to get deep into code. Fortunately, my consulting clients are super-flexible, and we can pick tasks that fit with the constraints on my time and concentration. We usually wake up when A- feels like waking up, which is around 11 AM or so. Some days, I set an alarm and wake up earlier so that I can take care of things or gently nudge A- towards being awake. After a relaxed breakfast, we head out for appointments, errands, or informal field trips. We might have lunch outside or at home, depending on the timing. A- usually naps in the carrier at some point. When we get home, we have an afternoon snack, tidy up, and play some more. We reconnect with W- when he gets home, and we might go for a walk to the supermarket together. We help make dinner, eat, tidy up, pack our lunches for the next day, and prepare for bed. We read a few stories, then settle in – sometimes with W-, and sometimes in A-‘s room. The first half of this year was like winding up a spring, and the second half was about letting it loose; pulling inwards and preparing, then A-‘s birth in February and an explosion of learning and activity. This time last year, I was heading into the second trimester of pregnancy. As nausea and vomiting receded, I regained a little energy. I helped W- tile the laundry corner and the bathroom in the basement. I sewed diaper covers and wet bags from PUL, and serged flats from thrift store flannel sheets. I filled the freezer with lasagna and lumpia. I used some of that time to sort out my tech, too. After finding out that Krita had all of the sketching features I needed, I switched back to Linux and started tweaking my setup. I won the Toronto Public Library hackathon with a tool for visualizing library search results on a map. I wrote little scripts to stalk videos at the library, check grocery flyers, visualize data, and automate other things. Also, John Wiegley asked me to start summarizing Emacs community updates, so I put together Emacs News: a filtered, categorized list of links from Planet Emacsen, Reddit, and other sources. That and consulting have been handy ways to keep a toe in the technical waters. Consulting-wise, I turned over most of my tasks, and the team’s doing way better than I could have with my much fuzzier brain. I’m still working on migrating some old code into a few add-ons for them, but fortunately they’re super-accommodating in terms of time, and other people take care of the bits that require more attention or coordination. Thanks to A-, I’ve been learning more about health and public resources. She was born with left-eye microphthalmia, with no vision in that eye, and she has adapted well to the prosthesis that will help her skull grow symmetrically. She also has a ventricular septal defect (a hole between two parts of her heart). It’s not quite large enough to clearly need surgery, but not small enough to rule surgery out, so we’ll just have to wait and see. Abnormal results from her liver ultrasound turned out to be a benign hemangioma instead of cancer (whew! ), so that’s one concern off our list for now (although I think we’ll need to monitor it with an annual ultrasound). W- started parental leave in June, and that’s been wonderful for both the big medical things as well as the little moments and memories. What’s the difference between 32 and 33 for me? There’s A-, of course, and the host of changes that accompany her. I’ve got a deeper appreciation for W-, and for various things (libraries! health care! the Internet! people!). I’ve had a lot of practice in equanimity and Stoic philosophy. I’ve seen lots of preparation paying off, and I have new plans to put into place. I’m learning a lot, and I’m looking forward to even more. 2015: Wrote a number of other-directed posts in the first half of the year, and then fell off a figurative cliff writing-wise. Mostly just focused on taking notes for myself these days. 2015: Pretty much all about this! 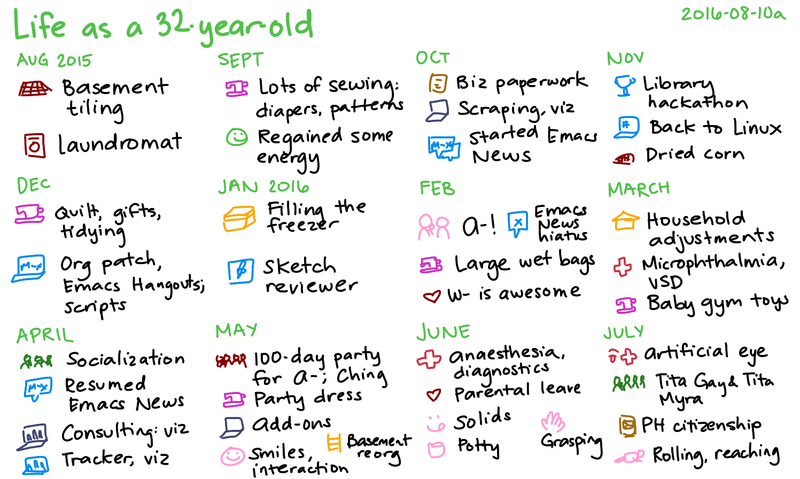 I remember being a lot sleepier and more fuzzy-brained this year than I’d ever been, and yet the year turned out pretty awesome. My long-term preparations have been paying off: the programming and data analysis skills I use for consulting, the paperwork-handling processes that support my business, the savings that cover expenses and reduce stress, the philosophical framework that supports equanimity, the 5-year experiment that gives me flexibility of time, space, and activity. 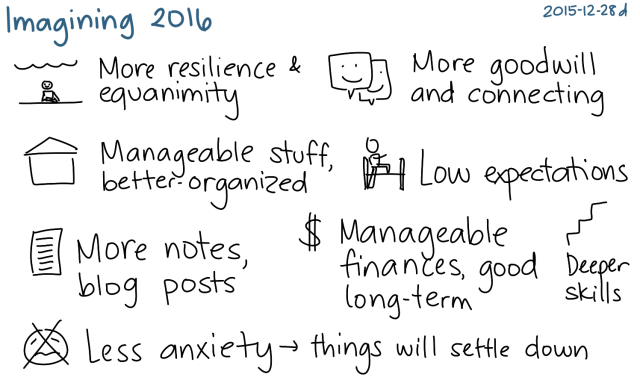 2015 was more challenging than 2014. Possibly as difficult as 2005/2006’s homesickness and transitions, although of a different kind – like the low of a cold, but longer and more severe. Even writing took a dive, as it was hard to concentrate and follow thoughts through. I’ve been getting better at weathering these times, I think. I have the space to take it easy. More video games this year, mostly ones that W- and I play together. 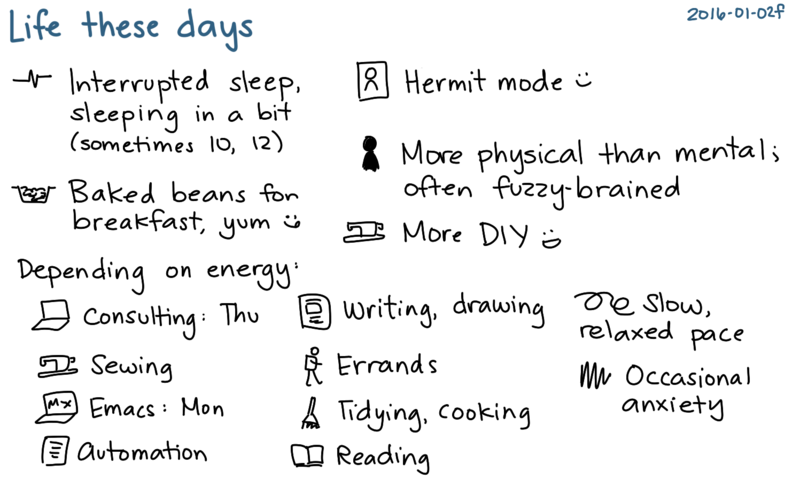 More cooking, tidying, walking, and sleeping, too. A lack of energy forced me to strip things down to their essentials and give myself permission to be selfish enough to minimize anything that drained me, even other people’s wants or needs. It was a little odd swinging from hanging out at Hacklab and having deep conversations with friends in the first half of the year to hermit mode (even from friends and family) in the second half of the year, but I’ve loved the quiet and freedom of this little world of ours. I might gradually reach out more someday, especially as I learn to push back when I need to, and as I slowly regain that appreciation for other people’s interestingness. In the meantime, W- has been wonderfully supportive, and it’s been great to have the slack from our earlier preparations. Despite this pulling-inward, there was also plenty of expansion this year. In sewing, I broke past some kind of wall that frustrated me before. I think picking a simple pattern and repeating it has helped me turn sewing into a relaxing way to make things I like more than the things I could buy. I learned how to laser-cut fabric, which was a fun way of adding even more geekiness to our everyday life. I swapped out my wardrobe for home-made things, often from fabric from the thrift store. I figure that this fuzzy-brain state might be a new normal, so it makes sense to figure out how I can make the most of it instead of being frustrated by it. That’s why I’ve been working on simplifying life, streamlining routines, automating what I can, and making checklists or documenting processes for things I need to do by hand. On the plus side, my internal observer makes the fuzziness more manageable, and I’ve been making my peace with the idea of growing slowly outwards from a small life. Speaking of small chunks, I developed the habit of drawing index cards almost every day. Well, I eventually switched over to digital equivalents of index cards, since that was a lot of paper. It turns out that an index card has roughly the information density I can deal with on my tablet PC’s screen without zooming in. In addition to drawing a daily journal, I occasionally explore thoughts and chunk them up into larger blog posts. Drawing-wise, I tend to settle into a very simple and spare style, although maybe I should pay more attention to colour and other niceties. Despite their simplicity, the index cards have been handy for remembering little things about each day and building up thoughts over time. A lot more video gaming, as I mentioned: getting through the fuzziest of times by playing on my own, and then settling down into a habit of 1-2 hours in the evening with W-. I’m a little surprised that sleep increased by only two hours a week. It felt like longer. Then again, an average of 9.1 hours a day is definitely up from the 8.3 hours of a few years back. More time on personal projects, more time on personal care, and a little more time on cooking and things like that. Financially, the stock markets have been pretty low, and my home country bias wasn’t particularly helpful. I’ve continued saving and investing, since that’s what you do when the stocks go on sale like this. My expenses were a smidge over my projected ones – mostly sewing, Hacklab, and a few miscellaneous expenses – but still manageable and well worth it. The experiment is on track and working well. 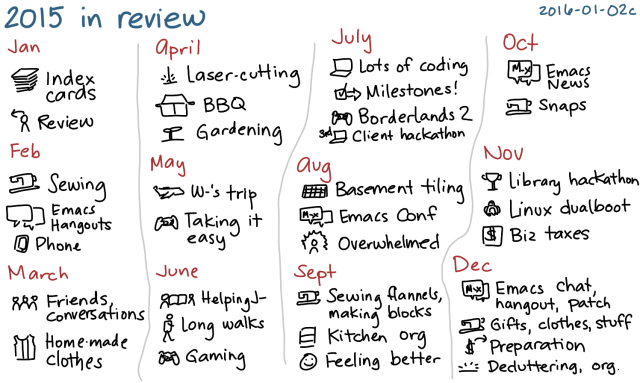 I have no idea what next year will be like, but I’m looking forward to seeing how the skills and processes we’ve been building up will pay off. I plan to do even less consulting, and to explore more DIY skills and more awesomeness around the house. I’d like to continue contributing to the Emacs community, and maybe keep my technical skills sharp with more automation and scripting too. 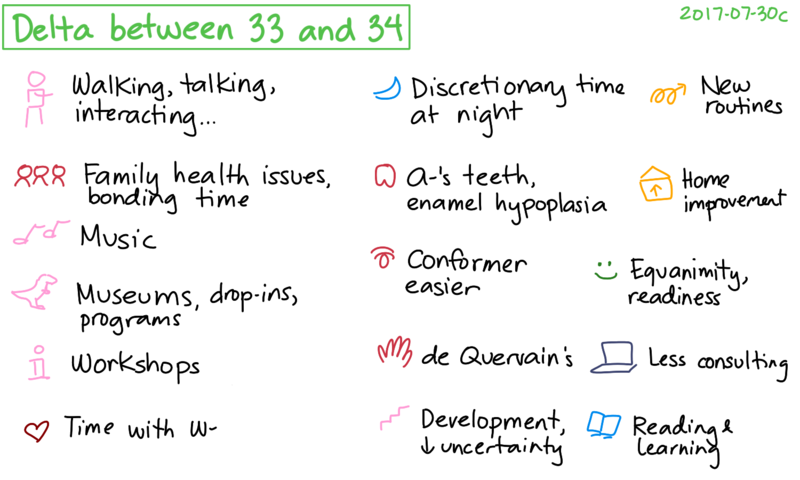 I’d love to continue drawing those index cards and gradually get back into the swing of sharing more notes. We’ll see how things work out! 2007: wrapped up thesis, graduated with M.A.Sc., started working at IBM; no calendar-year review? 2006: grad school, getting used to Canada; no calendar-year review? I used to host get-togethers as a way of thanking friends, catching up with folks, and seeing what interesting conversations come out of mixing people together. I was always stressed out right up to when people started arriving and mingling, though. It turns out that it’s totally all right to celebrate one’s birthday however you want. For W- and me, quiet days at home win out over noisy celebrations. =) Besides, I’m still in hermit mode these days. There’s been a lot of wrapping things up this year, closing long-running open loops. It feels good to reap the benefits of things planned and started by long-ago selves. I wonder what I can prepare for my future self. I think philosophy and reading will be handy, and maybe the skills and tools I build. Who knows, maybe sewing will be useful too. We’ll see! I have excellent health-related habits: I enjoyed the biking while it lasted. For now, this is temporarily limited to walking. Oh well! Our home life is wonderful: So much for yummy food, but yay for projects, decluttering, simple lives, great relationships, and so on. 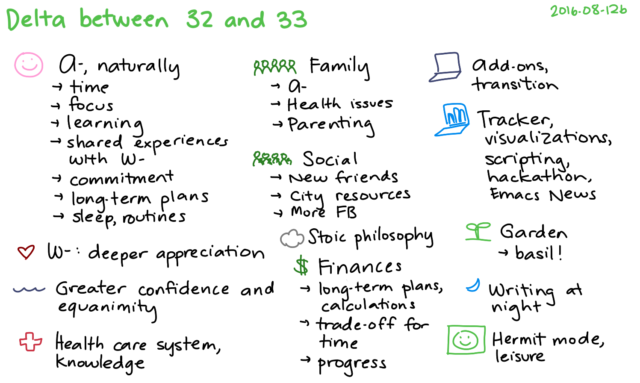 I helped my consulting client make successful transitions: Yup! I’ve broadened my business a little bit more. I’ve made it smaller, actually, but I’m happy with the outcome and with my reasons for doing so. 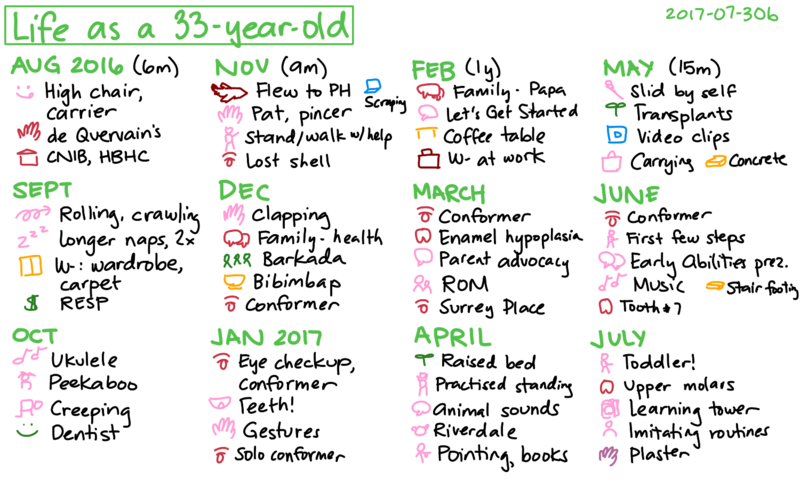 Compared to 30-year-old me, I’ve been both a lot more social (November to April or so) and a lot less social (these past few months). Hermit mode is surprisingly comfortable. I’ve dialed consulting back to one day a week, although I’ve also worked more intensely when needed. My current life is very relaxed and laid-back. Enough of a stock market downturn to make it onto my radar. Still not panicking, though, which is a good sign. Seems to be recovering. I’m in it for the long haul, anyway. 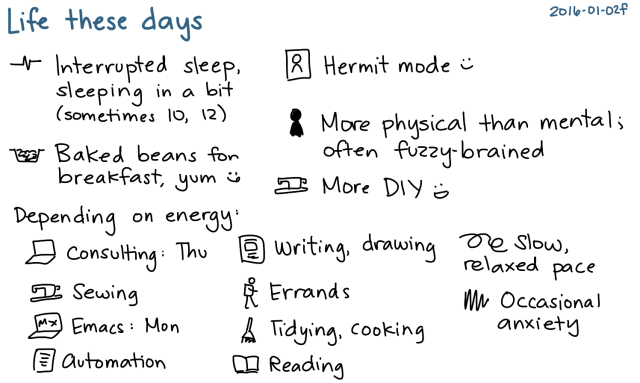 I really like this practice of drawing digital index cards to record my day and build up thoughts. They’re more granular and manageable than the 8.5×11″ sheets I used to draw. I used to draw with more colours. I’ve been mostly black-and-white these days, but I think I’ll get back to colours when I start feeling more playful about thinking. I learned how to play first-person shooter games. They’re actually quite fun. W- and I have been playing Borderlands 2. 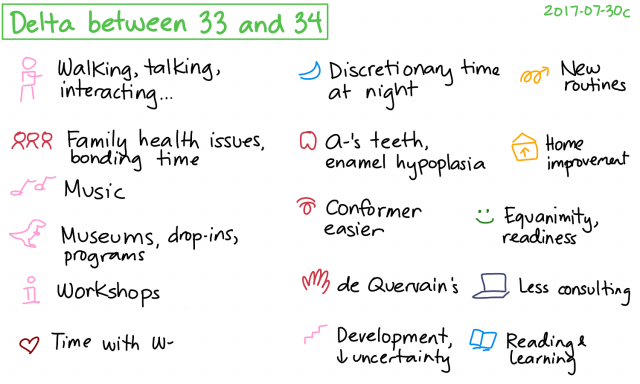 I’m more comfortable with fuzziness and uncertainty and experimentation (yay philosophy), which could be good for growing older and taking on more challenges. Life so far is already enough, and anything more than this is a bonus. 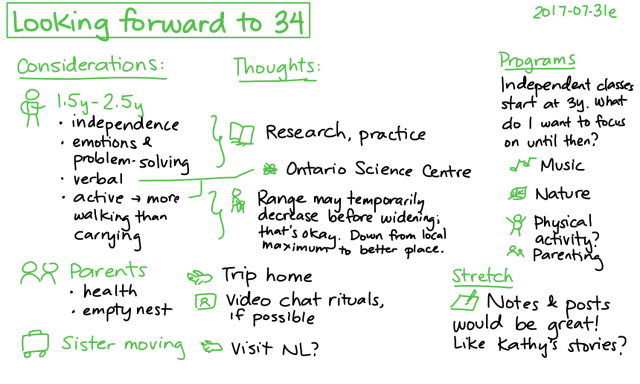 I wonder: what’s beyond getting things done? I’m home most of the time, although sometimes I go for a walk to the supermarket or the library. It’s a little frustrating feeling fuzzy or bleah, but at the same time, it’s good philosophy practice. It’s hard to write, but if I keep collecting fragments of thoughts, I know they’ll add up. Voluntary discomfort, momentary annoyances, and all that. With any luck, I’ll probably shift out of hermit mode sometime over the next few weeks. In the meantime, W- and I play Borderlands 2 in the evening. It’s fun coordinating our attacks and swapping loot. The blueberries and the strawberries in our garden have been extra-yummy this summer. Yay! The drip irrigation system that W- and I put in has been paying off, too. The garden’s a lot more lively now than it was last year. I have no idea what next year will be like, but I look forward to handling it with equanimity.